The Train is back behind the mic for the new podcast format, The Moe Train Show. Since Moe Train’s Tracks debuted back in 2007, Moe Train and King B focused primarily on the music scene. 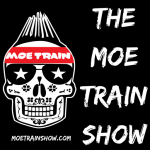 As the years progressed, Train delved more into the food scene, and then competitive eating, where he still competes in … Continue reading Subscribe to The Moe Train Show Podcast!